In this educational section we are going to share some important questions based on Indian Ancient History i.e. 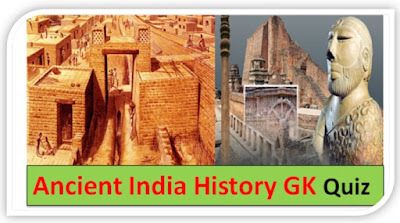 Ancient India History India Objective questions. These questions is very useful for all candidates who want to prepare for the various competitive exams. 2. Who among the following rulers was first to embrace Buddhism? 4. The words SatyamevaJayate in the State Emblem adopted by the Government of India have been taken from which Upanishad? 5. How did the Maurya Empire finally end? A) The last Mauryan ruler was killed by his General. B) The Kanvas of Central India deposed the last Mauryan ruler. C) The last Mauryan ruler was killed in a battle with the foreign invader from the north-west. D) The last mauryan ruler had no heir and the throne was claimed by one of his powerful ministers. 9. Who among the following Gupta rulers faced invasion of Hunas? 12. Which one of the following is associated with the Gupta Age of Indian History? 14. In which one of the following do we come across a detailed account of the municipal administration of Mauryas? 17. Which one of the following mentioned division of the Mauryan Society into seven classes? 19. Who among the following wrote commentaries on Harshavardhana's administration and the court life in Kannauj? 20. Which one of the following works deals with the history of Kashmir? 22. Who is said to be responsible for the spread of Jainism in Karnataka? 23. Which of the following statements about the Harappan people is incorrect? A) The Harappans were phallus worshippers. B) They worshipped gods in the form of human beings. C) They placed their gods in temples. D) They looked upon the earth as a fertility goddess. 25. Which of the doctrines of Jainism was added by Mahavira? A) Do not speak a lie. C) Do not commit violence. 27. Which of the following statements about the Rigvedic Aryans is incorrect? D) The practice of levirate was known. 28. In what respect did Jainism differ from Buddhism? 29. Who among the following occupied the supreme position in the Later Vedic pantheon? 30. Which type of pottery was most popular with the Later Vedic people? 32. The traces of Janapadas and Mahajanpadas are found in___? A) An extra tax levied on all subjects. C) It was a voluntary offering by people to the king. D) King’s customary share of the production normally amounting to 1/6th of the production. 34. Champa was the capital of which one of the following Mahajanapadas in Ancient India? 36. Harihara Raya I who ruled the Vijaynagara Empire for the period 1336-1356 belonged to which dynasty? 37. Which one of the following was the capital of Kosala? 38. Bimbisara was the founder of which one of the following dynasties? 39. Tuluva Narasa who ruled the Vijaynagara Empire for the period 1491-1503 belonged to which dynasty? 40. For which period did Harihara Raya II of Sangma dynasty ruled the Vijaynagara Empire? 41. Which of the following statement is/are correct? I. Pulakesn I was the first ruler of the Chalukya dynasty? II. Harshavardhana attacked the Chalukya territory during 608-642 AD? III. Vikramaditya I died in 608 A.D.
42. Who was the ruler of the kingdom between the rivers Jhelum and Chenab? 43. Which of the following statement is wrong? A) Dharmpala was the founder of Pala dynasty. B) Vikramashila University was founded by Dharmpala ? C) Bhoja was the founder of Pritihara Empire. D) Krishna III was the last Rashtrakuta king. 44. Who was the main male God worshipped by Indus people? 45. Which among the following is a place in Larkana district of Sind province in Pakistan? 46. Who among the following was worshipped during Early Vedic Civilization? 47. Who was the first Indian ruler who had territory outside India? 48. Which king started the organization of Kumbh fair at Allahabad? 49. The eighth-century tripartite power struggle was among which of the following? 50. Which among the following Kavya of Sanskrit, deal with court intrigues & access to power of Chandragupta Maurya? 51. Who was the last Hindu emperor of northern India? 52. Which of the following statement is/ are correct? 53. Which empire lasted the longest among the following? 54. What led to the end of Indus Valley Civilization? 55. Where were the hymns of Rigveda composed? 56. Which of the following statement is wrong? D) Chandragupta Maurya earned the title of the Liberator. 59. On which of the following systems of Hindu Philosophy , Shankaracharya wrote commentary in 9th century AD? 60. Which among the following is not a correct pair?